Where do you look when you walk into a space for the very first time? The majority will look down at the floor to make sure you don’t trip and hurt yourself. The architect who designed the space looked down too, at the plans and scale models. But do you ever look up? In the place nobody tends to look? Did they think about this place that nobody tends to look? This place, that nobody tends to look, is it a blind spot? Now walk into a space you know well. See it again for the first time. Go through the list. That’s the thing about blind spots – none of them are initially blind – we’re conditioned to blindness – to value certain spaces and things above others – which dramatically shapes the outcome – and the most sensitive time to influence these values is to start at the initial condition. What are your initial conditions? What do they say about your values? What’s missing? Over the last four months the HYPER lab has developed a Memorandum of Understanding (MOU) to help establish the initial conditions for new lab members, specifically in the Legal/Authority value dimensions. Here’s the draft: HYPER Lab Member MOU 2019. That’s the thing about initial conditions – they’re only initial. Although you may initially get them where you want to be, the physical reality of the environment/problem may dampen things quickly. Then you’ll know where the problem is. 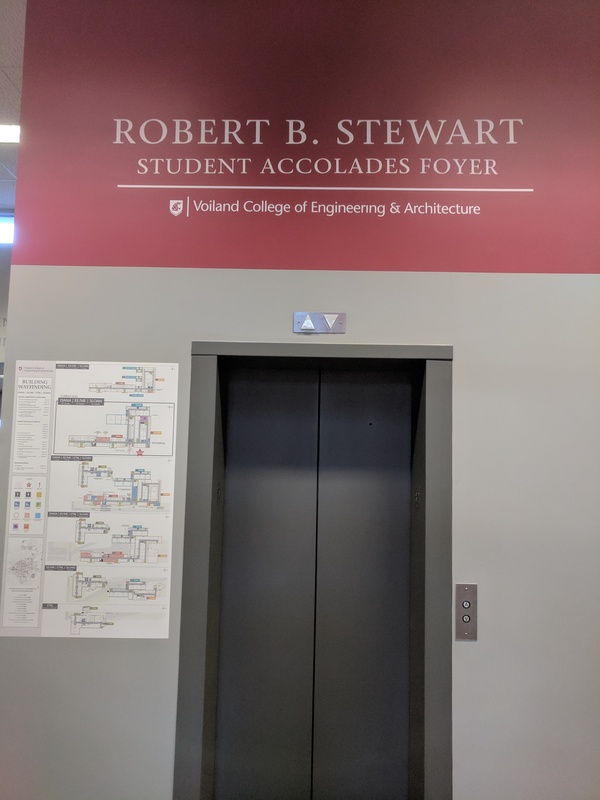 While we’re at it — props to the new maps and Robert B. Stewart Student Accolades Foyer at the main entrance to the VCEA complex. Everything about the space implies that from here you’ll go places. The new Student Accolades Foyer and maps are wonderful additions to the main VCEA campus entrance.